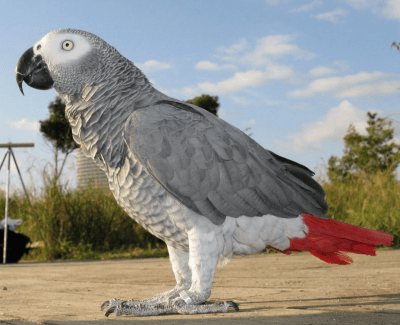 A couple are offering a £700 reward for the safe return of their parrot. Monty, an African grey, escaped from Janet Walder’s home in Knowler Way, Beltinge, on Thursday evening and has not been seen since. We followed him as far as the roof tops would allow and spent many hours after dark on Thursday night calling him and whistling his tunes. There are tunes we whistle, he does one line, we do the next and so on. He is such a comic, he does the telephone noise really well, then says “phone Janet, phone Janet, phone, phone, phone”. He loves the Eastenders theme tune and does it even when Emmerdale comes on, and he pretends to pull his claws out when he is asking for something. Someone said they thought they had heard him in Richmond Street so I have leafleted all around there but there is still no news. He must be petrified and exhausted – he is not used to flying outside. He’s used to being fed so I don’t know if he would be able to find food or even water. Monty is also a fan of grapes, toast with lots of butter and chicken. He may respond to his name, or if he is close enough, Janet recommends dousing him with water so he is too heavy to fly then throwing a towel or coat over him so he can be picked up safely. Anyone who has seen him or has any information should call 07889 312493 or 07788 918214.